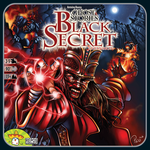 Yes, the player count for Black Secret is 2-5 (instead of 1-4) as one player will take on the role of Wu-Feng and harass the monks in a more direct manner than they've experienced previously. Wu-Feng now chooses where the incoming ghosts will be placed on the individual monk boards. Instead of placing the ghost on the board, Wu-Feng can use that ghost to power colored spells matching the color of the ghost or to bring new figures in play that scour the catacombs underneath the village; these figures are searching for the remains of Wu-Feng by digging in the dirt located there, and should they find the three icons required, the shadow of Wu-Feng descends on the village to fight directly with the monks. To aid the monks in their fight against this more devious incarnation of Wu-Feng, they have access to blood mantras, special abilities that come in different levels to adjust for the difficulty of play. With the level 2 mantra, for example, when a monk loses a life, the Qi token is placed on the mantra. When two tokens are on the mantra, one monk of the players' choice gains a Qi. With the level 4 mantra, all tiles will be de-haunted when it triggers.